How reliable are these data? There has never been good sourcing on these figures – and it’s always been hard to pin down precise numbers on this as neither the WTO nor Comtrade break down their trade data to tell us how much takes part inside multinationals (“between related parties,” as they put it) and how much takes place between unrelated parties. 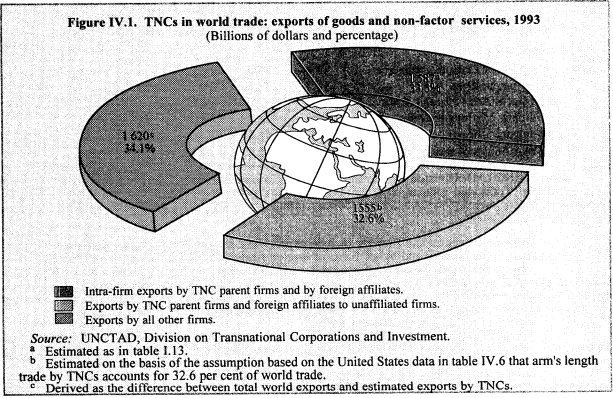 Back in 1995, by contrast, UNCTAD produced this graph (from p193 here), extrapolated from US trade data, suggesting that a third of world trade happened inside multinationals. However, this appears to extrapolate from US data to give a figure for the whole world. Is this reasonable? We don’t know. This table, however, seems to include domestic as well as cross-border transactions. Yet it is reasonable to assume that the share of related-party revenues is not so very different at the domestic level and the international level. (If anything, the share of related party transactions could be expected to be higher for cross-border revenues, given the incentive for tax avoidance inherent in those.) So perhaps “a third or more” is a better estimate. The World Bank research paper we mentioned earlier, entitled “Arm’s-Length Trade: A Source of Post-Crisis Trade Weakness,” provided a little more granular detail (AEs means Advanced Economies; EMDEs means emerging market and developing economies,): again, confirming the “third or more” figure, and the rising trend. If you were apply these ratios – between a third and two fifths – to the total volume of world goods and services trade of about $22.5 trillion in 2018 (according to the WTO) — you would get some $7-9 trillion (or more) in cross-border trade that happens inside multinational corporations. This multi-trillion dollar figure highlights the potential for illicit financial flows by multinational enterprises engaging in tax avoidance. And it also highlights the need for more public CbCR data. We’re not alone in asking for this. Momentum is growing for public CbCR. Not least from institutional investors managing $10 trillion in funds, who would also like to know what on earth is going on. Patent boxes: progress, or more racing to the bottom?